This topic will be covered under a series of posts starting from this week. In the past the wheel hub bearing assembly was assembled by incredible methods which were much dependent on the manual experience. Thus, the tolerance changed from situation to situation. It has passed quite long time since rotary forging approach was used to fabricate the wheel hub bearing assembly. The shaft clinching technology was developed to meet the requirement of customers on light weight and improved wheel bearing performance. The rotary forging approach needs quite higher assembly time compared to a kind of simple forging approach. However, rotary forging requires relatively small forming load with the result that precision assembly can be achieved. Of course, due to quite large assembly time of the rotary forging approach, a direct forging method has been studied but failed because of difficulty in controlling the preload within the required accuracy and frequent fracture of the hub bearing unit. In spite of remarkable contributions by many researchers, there still stand some strong obstacles against metal forming process design engineers in simulating such difficult forming processes as the rotary forging process for assembling the hub bearing assembly. It should be emphasized that it takes inherently quite long computational time to conduct the process simulation with its entire solution domain considered in such incremental forming processes as rotary forging (Munshi et al., 2005). Recently, Cho et al. (2011) developed a method of artificial planes of symmetry for simulating a sort of incremental forming processes and showed that it predicts quite reliable solutions at the midplane of the solution domain defined by two planes of symmetry when the plastic deformation occurs only around the local contact area. In the series of posts, an analysis model of the rotary forging for fabricating wheel hub bearing assembly is presented, based on the method of artificial planes of symmetry and the predictions are compared with experiments. 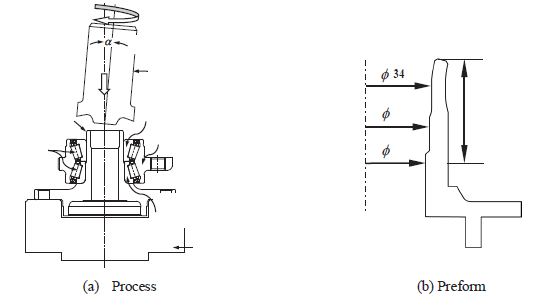 Figure 1 shows the schematic drawing of a wheel hub bearing assembly of which manufacturing approach is studied in this paper. This assembly is fabricated by assembly of a hub machined after forged and a hub bearing unit by a cold rotary forging process. 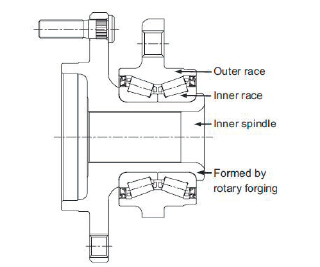 Figure 2 shows the mechanism of the rotary forging process for assembling the hub and the hub bearing unit. During being assembled, the bearing unit can be fractured if the excessive forming load is exerted. Also, the preload endowed in the hub bearing during assembly process has a strong influence on the performance of the assembly in its service because it can affect the wear characteristics of the assembly. Thus, the forming load should be properly controlled. In addition, because the end of the hub is much elongated in the circumferential direction during the assembly process, it sometimes exposes to ductile fracture due to the cumulative damage. For this reason, the contact condition between the end region of hub and the inner race of hub bearing should be optimally controlled and thus the optimal initial shape of hub material and optimal process parameters should be utilized for the successful assembly procedure. In the next week’s article, the details about the analysis model, meshing scheme and other relevant simulation parameters will be discussed. Stay tuned.